Posted on Thu, Apr 8, 2010 : 9:47 a.m. 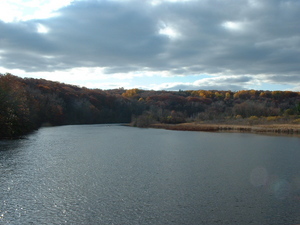 The Huron River last fall. You can volunteer to help protect and preserve this wonderful local resource. Last year I volunteered for the Huron River Watershed Council Bioreserve project . Four or five times over the summer I spent half a day tromping through woods and wetlands with other volunteers finding and reporting on what we saw. 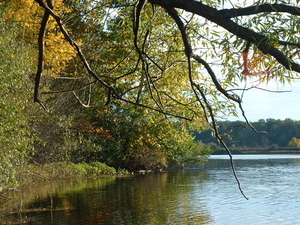 The resulting report is then used to identify areas needing protection, to help landowners appreciate their own stewardship, and to learn more about the Huron River watershed. The volunteer teams undergo a daylong training, and this year’s training will be May 1 from 10a.m.-4 p.m. The training is in assessing the different habitats - grasslands, forests, wetlands and aquatic. This hands-on get out and get muddy kind of experience is a great way to “get your feet wet” (usually literally) learning to get outside and look around for interesting things. The marker plants you will learn to identify are not the edible roster you will want to learn for more extensive harvesting, but the experience of plant identification and observation is invaluable if you want to be spending time out in the woods. I found that even the experience of going through a natural area following deer paths and at times making our own way to be unique and just a great experience. You can learn more about the Huron River Watershed by volunteering to do bio-reserve rapid assessments. The interesting mix of volunteers with wide ranging knowledge was also a great part of the experience. Each team has a plant “expert”, which is one of the ways you can learn just by going along. Even though I was tagged as the expert on my trips, there are huge gaps in my knowledge that were always filled by someone else in the group, so I was able to learn a lot as well. It is great fun to go tromping around in the woods, and doing it with like-minded strangers was a real treat each time. It is also a great way to learn and see more about this area. You’ll be accessing private land where people normally don’t go. We have amazing diversity and some beautiful forests around here, if you volunteer you’ll have a chance to appreciate the area in a way few people have. Here is how you can volunteer. Linda Diane Feldt is a local Holistic Health Practitioner, teacher, and writer. She offers free monthly classes through the People's Food Co-op. The next class is April 22, on Assembling and Herbal First Aid Kit. For more information you can follow her on twitter, or go to her Web site.